I’m sure by now you’ve all read Krv’s take on last week’s NECRONOMIDOL one-man in London, if not check it out here, because he put this experience into words far better than I ever could! But let’s just say; it was only a few months ago that I said that I’ll probably never attend an idol show for personal reasons (aka Japan is expensive), if you told March!Kerrie that in 4 months time she’d be having a quick chat with Necroma inside a tiny kitchen she’d say “did I get drunk and post bad self-insert fanfiction again?” But now I’ve had a few days to reflect on what the heck just happened, I can certainly say it’s real. I have audio files and photos to prove it. Tremendous thank you to Krv for taking these wonderful interview photos. Another big thank you to Ricky for just about everything else, translating, being able to fit us in despite the small timeframe, and just all-round being an awesome guy. And of course, huge thank you to the girls of Necroma themselves for being such great sports even when I was barely holding in my fangirlish squeeing and of course for putting on such an amazing concert! It was certainly an experience that I’ll never forget! It’s great to finally meet you! How excited are you to be in the UK tonight? Kakizaki Risaki: I’m really happy! This is my first time coming to the UK. I’m looking forward to seeing what kinds of fans will be here tonight and what’ll they’ll be like. There’s been so many people on Twitter saying that they’re really looking forward to seeing us. I’m surprised to see so many people that have come to see us today! I’m really excited. So far, have you noticed any differences between your Japanese fans, and your fans in other countries? Risaki: A lot of the fans in Japan are really used to us by now, so we can expect how they’ll react at our lives, whereas a lot of the overseas fans have come for the music and the experience, so we don’t know what to expect. They are kind of similar though, they all seem to share the same feelings that the Japanese fans have. For Rei and Himari in particular; As relative newcomers to Necroma, what prompted you to want to join? 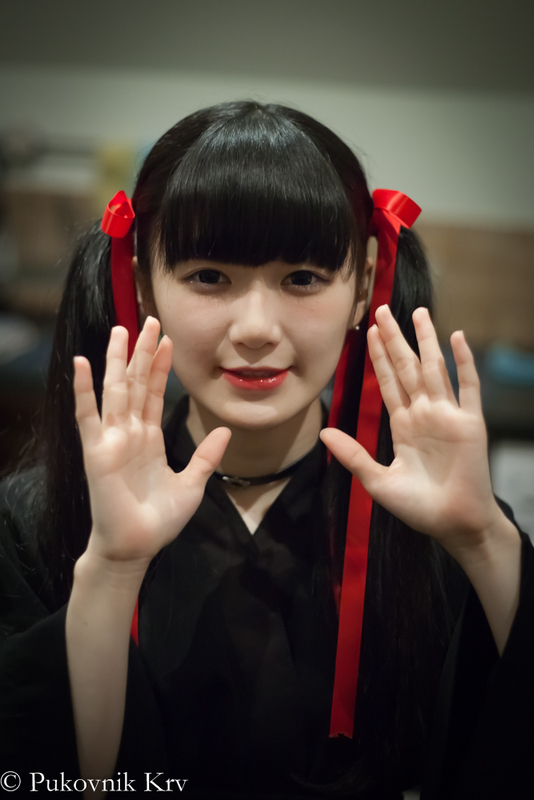 Imaizumi Rei: Necroma interested me because the colour and feeling of the group was really intriguing and unlike another other idol group I had seen out there before. Tsukishiro Himari: I didn’t start out wanting to become a traditional idol. I was drawn to Necroma because they were so different to other idols, and I really liked that there was a storytelling aspect within the lyrics and choreography. Do you feel like your time in Necroma has changed you as a person? And how is that? Rei: I can see my the growth in my performance every day and that’s really taught me how important it is to be continually focusing on improving! 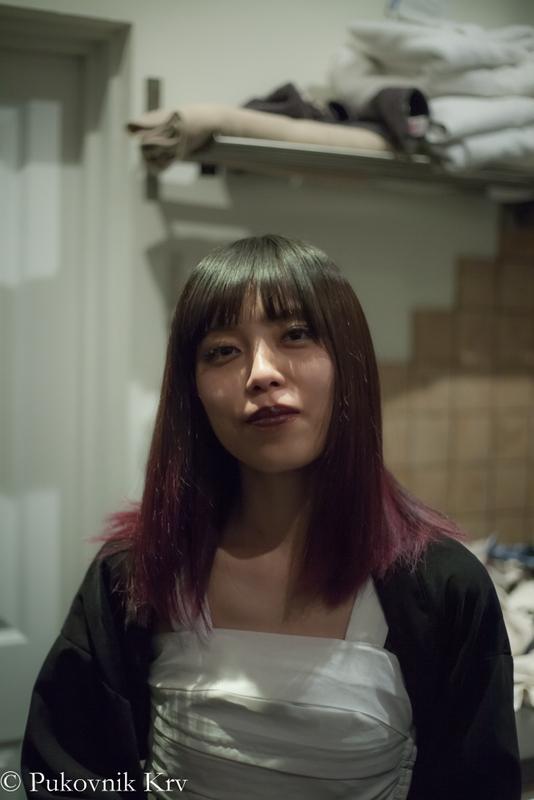 Risaki: Before Necroma, I was never a particularly social person. I had no experience interacting in a group, and at school I was never in any after-school clubs. It was really challenging to know how to interact with new members at first, but being a member of Necroma has taught me how to work as part of a team. If you could collaborate with any other artists, who would they be? Risaki: I’d like to collaborate with X Japan. Himari: Not exactly another artist per say, but I’d really love it if we made music for an anime show! If you had control of the group, what kind of costume/theme would you select? 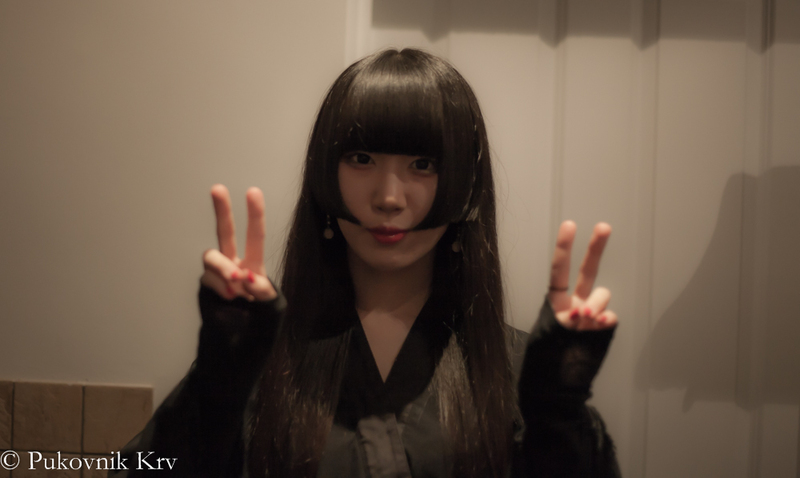 Sari: I’d change my private life so that it perfectly matched with my on-stage persona. Rei: I wouldn’t change anything. And the most important question; just how cold did it get when you were filming the “ITHAQUA” music video? Yotsuyu Hina: Super cold! Maximum coldness! Sari: I’ve never been so cold in my life! Risaki: I felt like my life was at risk! On the way out, we also enquired with Ricky if the Americas could look forward to a visit from NECRONOMIDOL in the near future. His answer? Well, it call comes down to money and demand. While he’d certainly love to take the girls around the USA and Canada soon, it’s also extremely difficult for an underground group like Necroma to secure such a huge venture, compared to more well-known acts who can easily get a sponsor to assist them. So, American fans, if you want that show, go forward and show Ricky just how much you want it! Spread your love for Necroma like a bad case of the flu so that there’s even more demand! If you’re lucky, maybe Necroma can follow the likes of Maison Book Girl or Tsurezure in a small Canadian tour with other artists? Basically, don’t expect anything soon, but don’t give up just yet! Also, it would be interesting to ask the difference between UK/JP fans again after the live etc, to see what they did make of us.